Jump racing returns to Musselburgh where Irish raider Winter Lion (2.05) should be able to maintain his unbeaten record over timber in the Novices’ Hurdle over the minimum trip. The selection carries the burden for a 7lb penalty for last month’s Punchestown success but there’s a lot to like about Matthew Smith’s five-year-old and he can follow-up under Mark Enright. Court Dismissed looked desperately in need of the run when fourth on his seasonal reappearance last month at Carlisle and is respected on just his second start over fences. The Donald McCain yard are yet to fully fire this term however, and preference instead lies instead with Lucinda Russell’s The Cobbler Swayne (1.30) under regular partner Peter Buchanan. The son of Milan has always looked like a chaser and was in the process of running well when brought down on his chase debut last month at Carlisle. He should be stripped fitter for the outing and can make it second time lucky over fences at a track where the trainer excels. Cobjayisland (2.35) was unlucky to bump into one last time out at Worcester but should be able to go one better to land the yard a quick-fire double in the 3m Handicap Chase. The selection has been raised 3lb for chasing home a well-backed winner for the Nigel Twiston-Davies yard but looked to relish his first attempt at three miles and should out-stay his five rivals under 3lb conditional Dominic Fox. Toby Lerone is a fascinating entry for the Skeltons at Towcester but is likely to be using the Novices’ Hurdle to set him up for a campaign over fences and a chance is taken on Robinsson (1.20) for trainer Oliver Sherwood. The yard won the corresponding contest last term with Come on Laurie and the Lambourn handler looks to have another promising gelding with the 118-rated son of Robin Des Champs. The selection goes well fresh and after two excellent efforts in defeat over timber last term and can make it third time lucky under Thomas Garner. Warren Greaterex’s Gee Hi (1.55) won’t be a ‘working man’s price’ for the Handicap Chase over the minimum trip but should justify favouritism under regular partner Gavin Sheehan. The selection runs under a penalty after a comfortable 24-length success at Bangor last week and should be able to score for the second time inside nine days. Ready Token (2.15) is another seeking to make it 2/2 over fences this term and should be able to oblige under Aidan Coleman at Market Rasen. 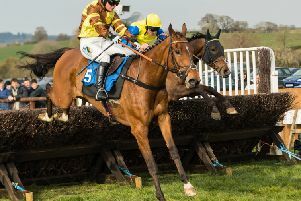 Charlie Longsdon’s gelding couldn’t have been any more impressive when winning on his seasonal debut last month over course and distance and still looks well-treated despite a 9lb rise at the weights. Barters Hill brought trainer Ben Pauling from off the cold list at the weekend and Ride on Time (3.20) can give the yard further success in the Novices’ Handicap Chase over two and a half miles. The selection is making his second start over fences after a promising debut last time out at Worcester. The son of Presenting was making his first start for five months and with the cobwebs blown away should give another good account. There’s all-weather action this evening from Chelmsford where Eight go to post for Chelmsford’s feature handicap over a mile and a quarter. Sir Mark Prescott’s Merritt’s Island is respected returning to handicap company but Godolphin’s unexposed filly Lovely Memory (6.15) is given the nod to score under exciting apprentice Edward Greatrex. The well-bred daughter of Shamardal shed the maiden tag at the third time of asking in a maiden at the track six weeks ago and was far from disgraced in competitive handicaps over a mile on her two subsequent starts, She was a fast finishing fourth last time out at the track 12 days ago and now upped in trip should go close for the in-form yard of Saeed bin Suroor.